There’s no better way to make the most of a great weekend than to cap it off with a relaxing Sunday Session at Hopscotch Restaurant & Bar. Bring your family and friends together to enjoy smooth tunes while relaxing under the trees with a refreshing drink in hand. Sunday Sessions run every Sunday from 11am until 2pm. Book your next function or event at Hopscotch Restaurant & Bar. We cater for intimate gatherings, corporate functions, large events and weddings. 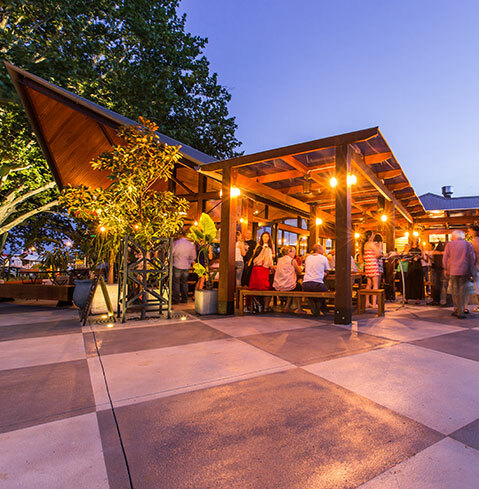 Or why not book your staff Christmas Party and take advantage of the beautiful park surrounds, relaxed vibe and modern, fresh Australian dishes on offer. We have set menus available or can work with you to create a unique menu that meets your needs.